A new edition of Jacaranda Outcomes 1 PDHPE Preliminary Course 5e Print & eBookPLUS is coming in 2018. The trusted market leader is now updated with new content, trends, research and case studies to engage students of all abilities and help them achieve exam success. You will be able to purchase this title later this year. To learn more about the series visit the Jacaranda NSW Stage 6 PDHPE page. 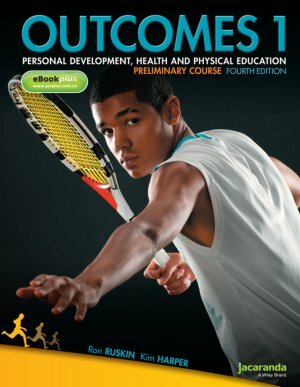 Outcomes 1 Preliminary Course 4E with eBookPLUS delivers comprehensive, authoritative coverage of the PDHPE Stage 6 Syllabus, providing questions and applications to encourage inquiry and skills development. • Formative preparation for the challenging HSC year through summaries, quizzes, revision tests and HSC-style questions. • Comprehensive coverage of the 2009 Stage 6 Syllabus by reliable and respected authors. • Both Core and Options chapters have been updated, particularly the statistics in tables, graphs and text in Preliminary Core 1. • Preliminary Option 2 Composition and performance now available as an online only chapter. • High quality illustrative material, particularly in Core 2. • First Aid Option 1 updated to reflect current practice (DRSABCD). • New Snapshots and case studies. • New inquiry and application questions. Outcomes 1 Preliminary Course 4th Edition and eBookPLUS is a hard-copy student text accompanied by eBookPLUS.